Swedish massage is the manipulation of superficial and deeper layers of muscle and connective tissue to enhance function, aid in the healing process, and promote relaxation and well-being. It reduces stress, both emotional and physical, and is suggested in a regular program for stress management. Get the benefit of being relaxed plus have deep pressure applied to focused targeted areas throughout your body to further stimulate relaxation. This massage is great for when you need extra attention to key stress points in your body. Deep tissue massage is a type of massage aimed at the deeper tissue structures of the muscle and fascia, also called connective tissue. Deep tissue massage uses many of the same movements and techniques as a Swedish massage but the pressure will generally be more intense. It is also a more focused type of massage, as the therapist works to release chronic muscle tension or knots. Swedish, Deep Swedish, or Deep Tissue massage can be selected for two people receiving massage on separate tables in the same room, providing a close and intimate experience for those in a relationship. 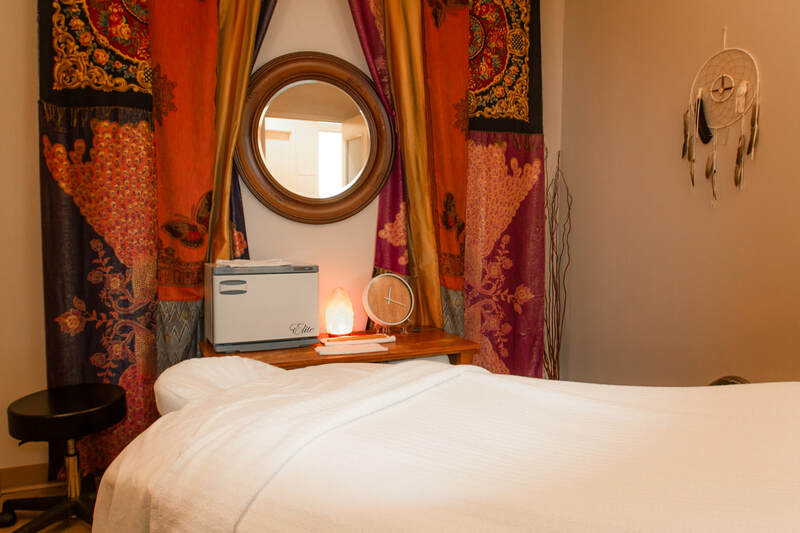 Each client receives individualized therapy while the rhythm and timing of the massages are coordinated between therapists to encourage bonding and relaxation. points (intense knots of muscle tension that refer pain to other parts of the body), and also to increase blood flow. It is often used to reduce pain. Hot stone massage is a specialty massage where the therapist uses smooth, heated stones, either as an extension of their own hands, or by placing them on the body while they massage other parts of the body. The heat can be both deeply relaxing and help warm up tight muscles so the therapist can work more deeply, more quickly. This service uses continuos stones throughout the entire massage. Pregnancy massage is beneficial throughout the nine months of pregnancy, as well as after delivery, and can include specific light and deep pressure massage, circulatory work, Craniosacral work to promote balance in the neck and sacrum and other relaxing techniques. We offer a relaxing and nurturing massage with our certified practitioners, using specialized cushions and pillows to ensure comfort and safety. After birth it is good to help nurture your body with massage to improve balance into your hips and neck. Many new mothers experience unique demands on their body, which massage can help with while muscles are training themselves for the different and specialized work of mothering. The lymphatic system is the roadway for the immune system. Its job is to protect and clean up the body. Lymphatic massage uses a very light, rhythmic touch to stimulate lymph flow. Primarily, it works the lymphatic vessels right under the skin, although deep core work can be utilized. This work takes place above the muscles, feels light and soothing, but is very powerful in manually moving lymph through the system, clearing out toxins and cleaning the system overall. Craniosacral Therapy works by helping the body's natural healing mechanisms dissipate the negative effects of stress on the central nervous system. Using a touch generally no heavier than the weight of a nickel, skilled practitioners can monitor this rhythm at key body points to pinpoint the source of an obstruction or stress. The practitioner works with light holds on the head and other parts of the body. This work is done without oil while the client is dressed in comfortable clothing. This modality is great to help with low back pain, sinus congestion, TMJ, migraines, whip lash and injury or stress to the upper extremities. Thai massage is a system of massage and assisted stretching that was developed in Thailand and influenced by traditional medicine systems of India, China, and Southeast Asia. It is performed on a thick mat on the floor, and the client wears comfortable clothes that allow for movement. Combining muscle manipulations with gentle stretches, the experienced therapist guides the client's body in ways that encourage energy flow to revitalize, rejuvenate, and refresh the entire body, similar to yoga. and restore balance in the body. It should be made clear that reflexology is not intended to diagnose or treat medical conditions, and is not a replacement for conventional medical practice. In particular, you should consult your GP if you are in the first quarter of pregnancy, diabetic or if you suffer from cardiovascular diseases. Myofascial Release is a safe and very effective hands-on technique that involves applying gentle sustained pressure into the Myofascial connective tissue restrictions to eliminate pain and restore motion. Trauma, inflammatory responses, and/or surgical procedures create Myofascial restrictions that can produce tensile pressures of approximately 2,000 pounds per square inch on pain sensitive structures that do not show up in many of the standard tests. Each Myofascial Release Treatment session is performed directly on skin without oils, creams or machinery. This enables the therapist to accurately detect fascial restrictions and apply the appropriate amount of sustained pressure to facilitate release of the fascia. Reiki helps to awaken your body's innate ability to heal itself by clearing blocked or stagnate energy in the mind-body and aura, which are the result of the negative thoughts and feelings we feed our bodies everyday. Reiki disinfects your mind and body of these negative thoughts and feelings, thus allowing the energy, or Qi, to flow freely.